Running a marathon requires strength, endurance, and perseverance in order to not only finish the run, but enjoy the run as well. Not too many people enjoy driving 26.2 miles, let alone running it and so for an individual to run a marathon it is important that they enjoy where they are running. Marathons happen around the world, but finding the best marathon to run can be a difficult task because there are so many to choose from. Because there are so many marathons in so many exotic places, it is not unusual for individuals to fly great distances in order to run in these events. After training for months on end, the individual might as well enjoy their run to fullest extent, whether it is the scenery during the run, the pre-race atmosphere or the grub and party provided after the race. After some research it has become clear that some venues are better than others, namely the Bank of America Chicago Marathon, the Virgin London Marathon, the Polar Circle Marathon and the Great Wall Marathon. As one of the biggest marathon races in the world, the Bank of America Chicago Marathon should be one of the most fun as well. People are lining up and down the streets for the entire 26.2 in order to cheer on the racers. Another benefit of the marathon in Chicago is that the course is very flat, which makes it a must-go race for both beginners and expert runners. Beginners like the race because it is easy to run, especially if it is their first race. Expect runners like this marathon because it has the potential to be very fast and has the potential for records to be set. Another great venue for a marathon is London, England. Rich with history in the marathon world, England is responsible for the arbitrary extra two kilometres to the 26 miles. Boasting as one the world’s largest marathons, the Virgin London Marathon is a surprising well organized. While all marathons claim to have an eclectic mixture of racers and fans, the marathon in London truly has a vocal and supportive fan base. Primarily, because of its close proximity to continental Europe and also because of the fact that one of the world’s largest airports is close. Racers not only enjoy the party atmosphere during the race, but the post-race party is one that cannot be beaten by any other race in the world…Many pubs feel inclined to give free pints to anyone wearing a race number. A place that not many would think to run a marathon would be the polar ice caps. The Polar Circle Marathon takes place in Kangerlussuaq, Greenland and attracts racers from around the world that come in to brave the cold and finish their 26.2 miles. Racers are surrounded by glaciers, snow and ice as they race through the frozen tundra of Greenland. Although part of the race takes place on a glacier itself, most of the race is run on a gravel road and temperatures can be expected to be in lower twenty’s. Unlike any other race, the Polar Circle Marathon pits racers up against Mother Nature for 26.2 miles. Finally, one of the most exotic marathons takes place in the country of China. Racers start on the steps of the Great Wall and run all 5,164 steps of the Wall while testing their endurance as well. Throughout the race, individuals take in the spectacular sights that surround the Great Wall. Racers run their 26.2 miles along one of the biggest pieces of Chinese history, moving up and down the numerous stairs found on the Wall. The Great Wall Marathon is a great way to combine an endurance event while exploring one of the world’s greatest historical mysteries. 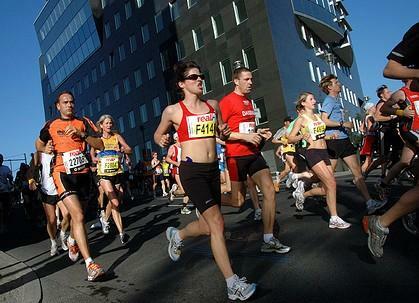 Running a marathon is a commitment that many individuals embark on every year. Choosing the right place to run a marathon depends on the type of experience the runner wants to have. There are a number of historic and exotic places a runner can choose to run their marathon and finding the right venue can be difficult, but there is the right race out there for everyone.